KIT digital Gains After Year-End Update | Headline OTC - Your #1 Source for Breaking Headlines in the OTC Stock Markets and Beyond! KIT digital, Inc. (NASDAQ: KITD) climbed 6.41% to $8.96 in the morning hour after the company provided an update on its 2011 performance, closed the asset purchase of Sezmi Corporation, raised its 2012 guidance, and implemented plans to move its secondary listing from the Prague Stock Exchange to the London Stock Exchange. The company now expects revenue of at least $320 million for 2012, up from the $300 million previously projected. The company also expects earnings of least $1.53 a share, up from the $1.45 a share it had previously called for. During Q4 2011, The company signed over 35 net new and extended customer contracts, including AOL, eTV (South Africa), Grupo Clarin (Argentina), Liberty Global, NBC Universal, OSN (UAE), Prisa (Spain), SA TV (Bangladesh), Starhub (Singapore), Telecom Argentina, The Walt Disney Company, and the U.S. Olympic Committee. IBM was also added as a key new technology, marketing and deployment partner. KIT digital’s client base totaled more than 2,450 customers at December 31, 2011. 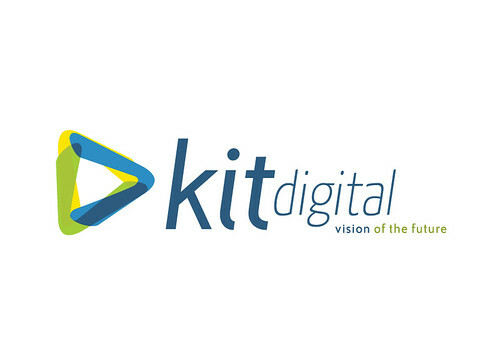 KIT digital, Inc. incorporated on August 11, 1998, through its operating subsidiaries, provides enterprise clients an end-to-end technology platform for managing Internet Protocol (IP)-based video assets across the browser, mobile device and Internet protocol television (IPTV) set-top box-enabled television set. Written by: Richard Carlyle on January 12, 2012.